What does an average user expects when he or she shops for a chess software? I guess, first of all it should fulfill the main purpose of any chess program.. well that is play chess. Let’s take a closer look into Chess King’s menus. It has “Quest mode”, “Chess puzzles”, “Random games”, “Custom games” and “Classical Chess” buttons. Let me briefly talk about each one. 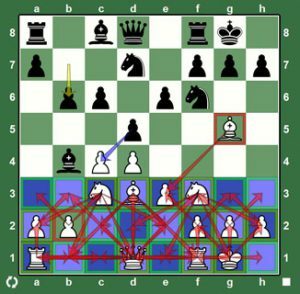 This mode allows to play quick games against pieces and/or pawns handicapped Houdini engine. The time control is 10 minutes for human and 3 minutes for engine. There are 25 playing levels which differ by the material difference between human player and computer opponent. On the easiest level you are offered to checkmate Houdini 2 with 2 Rooks and Queen vs. King. The ability to complete this task corresponds to 100 ELO. On the hardest level the material difference between human and Houdini 2 is just a single pawn. You need to be about 2800 ELO to win that against the engine. This is pretty self explanatory section. The goal is to improve player’s tactical vision by solving a series of chess problems which starts with basic chess rules and captures and ends up somewhere in mate in 3 category. I believe, this type of exercise is the most effective way to get better at chess. The only problem I encountered while going through the puzzles is that you are forced to go through very easy basic things like chess rules and simple captures in order to unlock more difficult (and useful) ones. While it is a good idea for a novice players to go through fundamentals, it may be a waste of time for class players, who might like to skip a good first half of the problems. Correction: There is also another way to unlock the harder puzzles without going through easy ones. This unlocking is possible by increasing your game experience level by playing chess engine, doing chess quests, etc. If you thought from the title that it’s simply a Fischer Random chess you were wrong. In this section you can setup a type of game you want to play against Houdini 2. That means you can choose number of pieces on the board (from 4 to 32), set a pawn percentage (from 0 – 100%) and also the overall “pieces” advantage for yourself. After the settings are adjusted, pieces and pawns are diluted by empty squares, the computer will come up with an ELO rating needed to beat Houdini 2. For example, I tried setting Total Material = 24, Pawn Percent = 50%, Advantage = 25%. Computer evaluated this conditions as an “easy game” and assigned 934 ELO. I tried to beat a Houdini 2 in this variation but it not as easy as it looks against an average 900 rated opponent. In fact I have not won a single game out of 3 (yes there were draws). However, I had no difficulty beating Houdini 2 in classical game, when he was handicapped at 2000 and 2200 ELO. This is a “position setup” mode. You can setup a position that you want to study, analyze or play. It is done by using a simple interface using drag-and-drop approach, by simply placing pieces on the chess board, selecting the side to move and choosing ability (or inability) to castle. It is possible to generate various chess 960 positions from this interface as well. That’s a place to play normal, classical chess (well, against a computer of course). When we get into the “Train” option in the main menu and choose “Classical Chess”. Then it is possible to adjust playing strength of a very powerful Houdini 2 engine from weak 700 ELO to incredibly strong 3200 ELO by 50 points increments. The playing environment is pretty well organized. 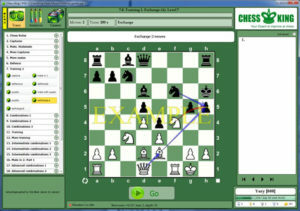 With current settings Chess King announces all of the computer’s moves and also shows it with arrows. The score-sheet on the right side of the screen can be set to “simple” or “advanced”. Personally, I like the “simple” table-like view better, it is much easier to use and read than scrambled “advanced” mode. Since the game is unrated computer immediately assigns a numerical value to the position after each move. Main menu is on the left side of the playing Chess King’s screen. It’s equipped with standard options like “Take back”, “Force move”, “Offer draw”, “Resign”, “Show best move”. Right below the main menu, there is a hint panel, which is a pretty cool feature. It allows to control on screen arrows which can be assigned to show opponent’s moves, attacked pieces, attacking pieces and also a bunch of positional factor like weak squares, pins, central control advantage and many more. These features can be only turned on only individually since otherwise the screen can get overloaded with arrows. In other words the Chess King’s interface is plain and simple. 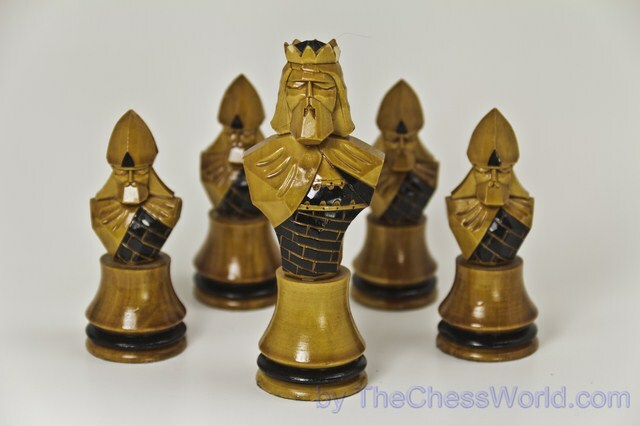 It will fit most of the players that do not want to adjust many settings but just play chess. Why? Well, there aren’t that many customizable options in the first place. I was not able to change the chess board and pieces look, so I assume you cannot do it in the current version of Chess King. Another thing which I was surprised about was the inability to view the chess engine analyzes lines in the game mode. Most software packages prevent using the engine in rated game mode, but allow it to be used in training mode for analyzes purpose. Chess King only shows you the best move and position evaluation without showing the actual lines. I have played a few games against Houdini 2, starting from about 1000 ELO and ending somewhere at 2500 ELO. 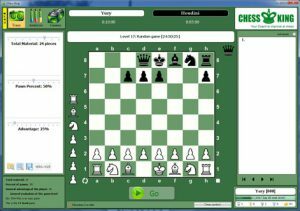 I will show you the game I have played against 2000 ELO Houdini, not only for the sake of chess but also to show the ability of Chess King to export games into dynamic format which can be inserted into blogs or webpages. It’s quite a useful feature for those people who want to show off their games online. Even though we skipped a few important features such as game analyzes and chess games database functionality (which will be covered in part 2 of this review) it is possible to draw some conclusions about the Chess King software. Generally it is a good deal for people who want to get all in one chess package, with all the basic features a chess player might need. 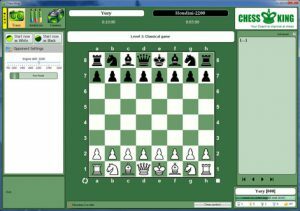 It has many “pros” such as a strong Houdini 2 engine, huge build-in chess data base, tactics trainer, dynamic chess board creator, diagram maker and other fun little things such as quest and random game modes which many chess players would enjoy. 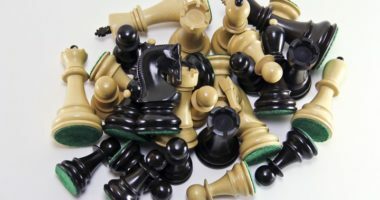 By using Chess King a chess player can do almost anything related to chess: use chess engine for play or analyzes, browse chess database for opening study or opponent preparation, practice tactics puzzles for improving a tactical vision. Chess King also has some flaws that, I assume, will be fixed in future versions: poor visual effects (only one chess board and set), inability to change background colors, move windows around and customize other minor things. Tactics trainer is although useful, lacks adaptively, meaning that even a master strength player would need to go through the chess rules and capture basics if he wants to unlock harder ones ( Correction:it is possible to skip easy puzzles by playing and winning games against the engine, completing quests, etc.) Engine cannot be adjusted by a user, for example in Arena 3.0 it is possible to adjust the parameters of the engine such as value of pieces, aggressiveness, positional factors, memory use, etc. (this option is only available in Chess King Pro version). Nice review of Chess King! Just a couple comments: 1. I think the lack of many types of boards, colors, 3D, is an advantage as often kids are distracted and spend too long picking colors and sometimes 3D pieces that make it harder to thinkabout playing the best move. The chosen green can be considered “optimal” and 100% of the time is spent studying 2. It is possible to “skip” over levels by doing other things than just doing Quest games and solving puzzles. If you play a “random” game with say an advantage of “only” +3 ( 1 piece up) and beat Houdini, you should see your level going up pretty fast and puzzles levels should be unlocked. Good luck! [quote name=”Bernie”]Are you sure you are playing the engine this is a basic chess Queen”s Gambit trap. The part 2 of the Chess King Review is not finished yet. It will come out sometimes soon. Stay tuned! Nice review. Very fair and concise. But where’s the Part 2? I can’t seem to find it. Well, that’s a question to creators of Chess King. Who do you play when you select classical game and adjust the playing strength. I’m pretty sure it was the engine though. I was kind of surprised too it fell into a simple trap like that. But all engine have weaknesses, you now. Are you sure you are playing the engine this is a basic chess Queen”s Gambit trap. I’m glad you find the review helpful. Hello Steve, and thank you for the clarifications you have made. I have updated the review and included the correction about the possibility to unlock puzzles via playing vs. Houdini. I have also included the fact that engine parameters can be adjusted in Pro version of Chess King. I did not have a chance to see that version, so I only did a review of “non-Pro” version in which you cannot adjust the engine. Very good review, thanks. I will think about getting Chess King Pro. Not so! Quest mode and Puzzle mode levels are linked to a users Experience Level, determined by the number of experience points gained. Since experience points are gained through a variety of means, s player could play nothing but classical chess games against Houdini and very quickly “level up” fast enough to unlock higher tactical training levels. Chess King Pro does allow many Houdini engine parameters to be reconfigured, including hash size, tablebase RAM cache size, pondering, contempt value, etc.